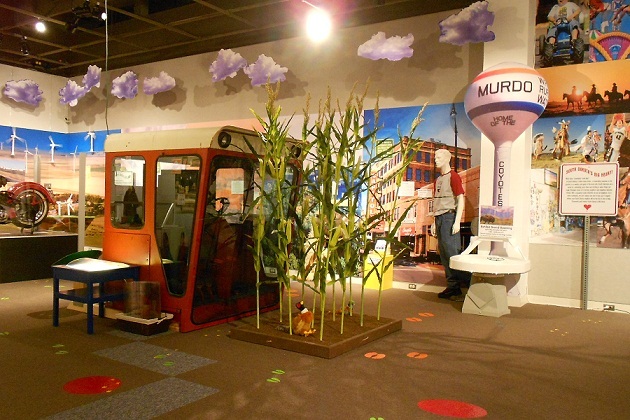 The award winning exhibit, “Our South Dakota: Big Land\Big Ideas\Big Heart,” at the museum in the South Dakota Cultural Heritage Center in Pierre will be closing on Sunday, March 10. “Our South Dakota,” recipient of the Award of Merit in 2012 from the American Association for State and Local History, will close at the end of business on March 10, following an 18-month run. A new exhibit entitled “Furniture: The Fancy & The Functional” will open at the end of April. “While we are always sorry to see an exhibit end, we are excited by the next exhibit and the new programming opportunities it brings,” commented Jay Smith, director of the Museum of the South Dakota State Historical Society. The planned closure of “Our South Dakota” is part of the museum’s exhibition plan that calls for more exhibits to be featured at the museum in the future. Museum staff plans to use some of the more popular elements of the “Our South Dakota” exhibit in other areas of the Museum. New programs related to the new exhibit are being planned in the coming months, Smith added.